A glorious shrub native to Eastern North America with incredible fall color and attractive, burgundy seed panicles that are an important food source for birds during winter. A tea that is high in vitamin C, said to taste like cranberry lemonade, can be made from the ripe berries by infusing in cold water overnight, then straining through cheesecloth or coffee filter. I’ve never tried it, but it sounds delicious! This entry was posted in Country Living, Field Notes, My Photos and tagged autumn, Bird food, fall color, native shrubs, Rhus typhina, seed panicle, Staghorn sumac, sumac tea, vitamin C, wild foraging. Bookmark the permalink. What a gorgeous photo! Looks tropical! I’ve been wanting a good Staghorn Sumac photo for weeks now! Looks like you found the perfect spot. Are these near your garden? I would love a cup sumac lemonade, thanks! It must be so beautiful there! Absolutely gorgeous photo, Eliza. Now you’ve got me thinking….there is an ingredient called sumac used in MIddle Eastern cuisine which adds a bright tang to things. I haven’t found it yet but a friend advises that it is a ground up thing (maybe from this plant?) and adds a nice lemony quality. Hmmmm….. Since this sumac is native to the US, it is not be the same plant, but another species (Rhus coriaria) you speak of. Our sumac might be an adequate substitute, since both impart a lemony flavor. I always thought Sumac was poisonous! Yikes. But how could anything so beautiful do me in? 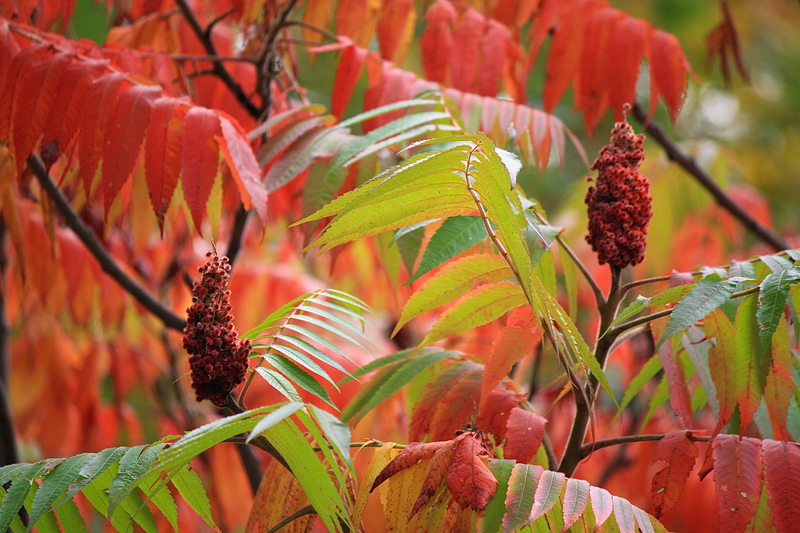 Poison sumac is no longer classified as Rhus vernix, but given its own genus Toxicodendron vernix. The common name still sticks, however. Poison sumac is rather uncommon, grows only in wetlands & has smooth stems and white berries as opposed to the safe Staghorn which is fuzzy stemmed with red berries. I love sumac and used it a lot in dyeing. It could be used as a mordant or by itself. If gave a light brown color. Its harder to find now. The road weed wacker machines cut it down. By itself its a wonderful fall decoration. Thanks Eliza for reminding me about this wonder plant. And I too would love a cup of sumac lemonade. Do you use the berries or stems to make dye? I would think it wouldn’t be hard for you to find, there is so much of it around here. How about by the river along Rt.112? Love when I see your title and just a hint of the picture at first. As soon as I saw this one, I knew I would LOVE it. 🙂 Thanks so much, Kim! Thank you, Diana. I love your photos, you’ve a great eye! I sent your seeds yesterday so look for them:-) Got them dried, finally! Thank you so much – you are so kind to share that! I appreciate it! I see these and never knew what they were. I love them.